The Supreme Court’s ruling on public invocations in the name of Jesus is a ruling of seismic proportions. It begins the process of ratcheting back the strangulation of religious liberty in America that began with the Court’s egregious ruling in Everson in 1947, which led to the removal of Bible reading and prayer from our public schools by the early 1960s. We’ve now reached the point where students have their Bibles confiscated during personal reading time and others cannot even hand out candy canes to classmates at Christmas. But the Court’s ruling on prayer represents a sea change in constitutional jurisprudence. And in the process, the Court, unwittingly or not, declared that every cross and every Ten Commandments monument on public property is perfectly constitutional. The monumental change in the Court’s thinking has to do with how violations of the Establishment Clause are determined. The prior standard was “endorsement.” If some government body could be accused of “endorsing” religion – which meant nothing more than saying nice things about God – then the Stormtroopers swooped in and gagged and handcuffed the miscreants. But the Court in Greece v. Galloway changed the standard from “endorsement” to “coercion.” A violation of the First Amendment can now only be claimed if coercion can be demonstrated. Because no one is forced against his will to participate in an invocation before a legislative assembly – attendees don’t have to stand, bow their heads, fold their hands, close their eyes, or even stay in the room – then it is not possible for a constitutional violation to occur. The Court wrote that a “fact-sensitive inquiry” concluded that “the town is not coercing its citizens to engage in a religious observance.” The Court tacked this down by adding, “[L]awmakers did not direct the public to participate, single out dissidents for opprobrium, or indicate their decisions might be influenced by a person’s acquiescence in the prayer opportunity.” In other words, no coercion, no First Amendment violation. Virtually every misguided and misbegotten legal challenge to religious liberty has been rooted and grounded in this entirely subjective and sniveling complaint that someone has been personally offended by someone else’s religious expression. That ground of complaint is now gone, buried where it belongs, in the graveyard of foolish, juvenile and un-American notions. What few people have recognized is that the Court also just declared the constitutionality of every cross and Ten Commandments monument in America. 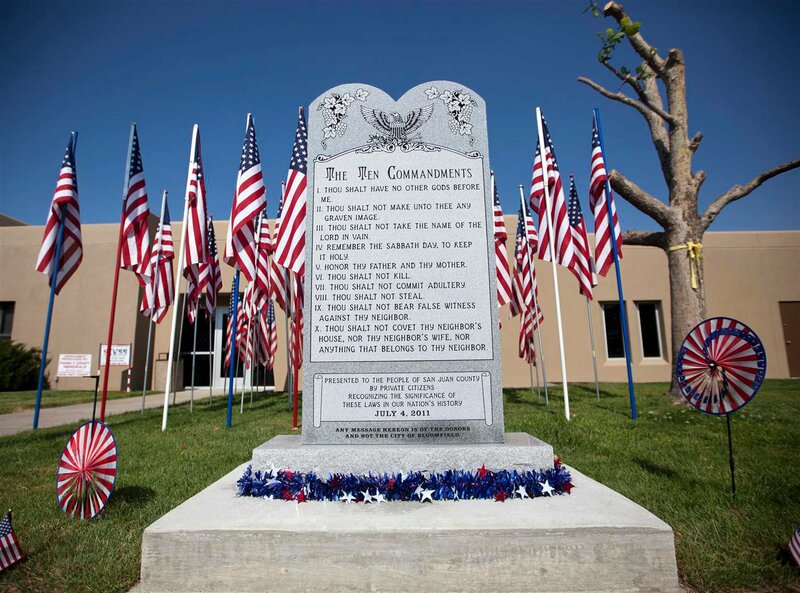 Whatever else Ten Commandments monuments represent, they are clearly examples of religious speech. In fact, Christians believe that every one of the words in the Decalogue is a word from God himself. But the Court clearly ruled in Greece that the mere fact that what is being dealt with is an expression of religious speech is not sufficient as a basis for a constitutional challenge. And more to the point, there is no coercion of any kind involved in either Ten Commandments monuments or crosses, or with regard to the Jesus statue on a ski hill outside Whitefish, Montana. With regard to Ten Commandments monuments, for instance, no one is compelled to notice them, observe them, read them, believe them, agree with them or obey them. No coercion, no violation. It’s a beautiful thing. With regard to memorial crosses, no one is compelled to look at them, study them, ponder them, like them, or agree with the message they represent. No coercion, no violation. With regard to the Jesus statue in Montana, no one is required to stop and look at it, appreciate it, meditate before it, or worship or even admire the person it represents. Everyone is perfectly free to ignore it and ski right on by it as if it does not exist. No coercion, no violation. Now of course all of this depends on a Supreme Court that shows some kind of consistency in the logical application of its own ideas. Anthony Kennedy in particular can be a squirrelly-bird when it comes to rational thought, wandering off into emanations and penumbras and absurd, 60s-ish ruminations about defining the concepts of one’s own existence. But if the Court shows any constancy at all when the next monument or cross case appears before it, these expressions of religious speech will be safe and secure. And America will be better for it. No coercion, no violation. Let freedom ring.